There are loads of ways to let your hair down after a long day of studying – here’s just a few events that we’ve got on this week. Live Music Mondays with Live Soc – From 7pm in The Bridge with FREE entry. Enjoy great live music with a drink, plus food from the delicious Bridge menu is available until 8:30pm. UV Rave – at The Union in Winchester from 10pm until 1.30am. Grab your tight and bright, get your glow sticks ready and don the UV paint, it’s time to rave! Tickets £2 and are available on the door. Open Mic Night – From 8pm in The Bridge with FREE entry. The first Open Mic Night of the new term, compered by Comedy Soc. Musicians, poets, comedians, magicians – all wanted to perform! Food available from The Bridge menu until 8:30pm. Grad Ball Tickets go on sale! Tickets for Graduation Ball 2013 on sale to graduates from 8am – available from www.susu.org/boxoffice or in person from The Box Office at Reception (Building 42). Student Therapy – at Oceana from 9pm until 3am, with tickets only £2.50 from www.susu.org/boxoffice. Post Grad Quiz – from 7pm in The Bridge. Test your knowledge in the quiz run by postgrads for postgrads. Karaoke – in The Stag’s from 9pm until 1am, with FREE entry. Weekly karaoke night, with a special pizza and drink deal for just £4.95. Time Out – in The Stag’s Head from 4pm until 10pm with FREE entry. Top off your week with great offers on a range of drinks, plus live music brought to you by Live Soc from 7pm. Late Night Bar – at The Bridge from 10pm until 2am with FREE entry. Our friends at Soul Cellar present Electro Swing Night – take advantage of this great night of free music. 6 Nations Rugby – showing in The Bridge. Next round of the Six Nations, with the highlight being England vs France showing at 5pm. Weekly quiz night with the chance to win a cash prize, plus enjoy a tasty curry to help get your brain in gear. 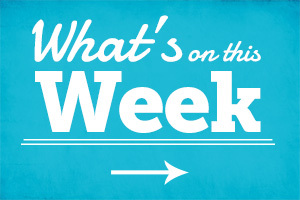 This is just a selection of everything going on at SUSU this week – visit our online calendar at www.susu.org/calendar to see a full list of everything happening. « Here are your candidates!